Note this is not a FASST receiver. 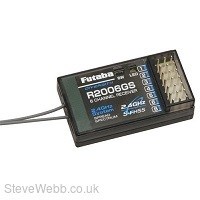 Supplied with the new 6JG radio set, the 6 channel R2006GS full range receiver is both small and light, and uses Futaba's advanced FHSS transmission system for superior interference rejection. It can be used together with a wide range of Futaba transmitters, including 2PL, 3PL, 4PL, 4YFG and 6JG and can operate as both FHSS and S-FHSS.